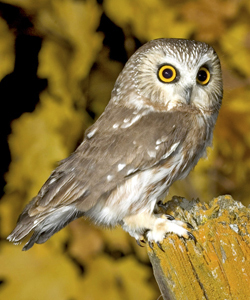 The smallest owl in North America is the tiny Northern Saw Whet Owl. A ferocious predator of mice and other small rodents, they are great birds to have around to help keep the mouse population under control. If you live in a forested area, you might consider putting up a nest box now for these owls. Even though their nesting season typically isn’t until around March, getting the nest box up before late winter will increase the chance of owls moving in. Adding a brush pile, sprinkling seed on the ground under feeders, and keeping branches on the trees on your property will make your yard more interesting to these tiny predators. While you may never actually see these strictly nocturnal birds, if they move in, you hear their distinctive high-pitched call from January to May. Want to build your own next box, or find more about making your yard attractive to Saw Whet Owls? Click here for nestbox plans and more in this article from from Cornell Lab of Ornithology. Make a Difference – Sign Up For the Christmas Bird Count! Is Your Backyard Ready For Winter Birds?